AH: Of the three Bizet translations I have written, this was the first. I know of no other composer whose librettos are so amazingly diverse. 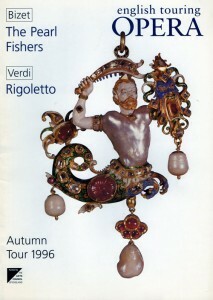 This translation – perhaps the hardest of the three as it’s the least good libretto – was commissioned by English Touring Opera for their production in 1996. The cast included Adrian Clarke and Nicholas Sharratt; it was conducted by Andrew Greenwood and directed by Caroline Gawn. I think I see her now. Oh! It’s a glimpse of heaven! The people fall to their knees. and the crowd is on its knees. there’s a strange obsession burning. I am consumed by a yearning.